The holidays are just around the corner, and shopping season is in full swing. Whether you celebrate Christmas, Hanukkah, or something else entirely, if you are in the practice of exchanging gifts, you might be clamoring to find the perfect present for the farm kids in your life. Even if the seasonal consumerism craze makes you queasy, gift-giving is a great opportunity to encourage a child’s passions. If you have or know a kid that is always looking to help around the homestead, here are some presents that will inspire them and keep them engaged around the farm. Many retailers sell sets of garden tools for kids that are appropriately sized for children and made of lightweight materials that are safer and easier to handle than your adult tools. Your little farmer will love to have their own colorful spade, hoe, rake, and shovel; you can also purchase kid-sized gloves and a mini-wheelbarrow to accompany the set. Come spring, you can even demonstrate how to properly use the tools in your real-life garden. Take your child’s love for gardening to the next level with a grow-kit that lets them experiment their green thumbs. Especially for the winter, these indoor gardening kits are a great nature-based activity to break up long winter nights of board games and books. Brands like Our Garden even sell grow kits with clear cases to view the roots so your little farmer can learn first-hand about how plants grow. Books always make a great gift for curious young minds. Tractor Mac is a series of children’s books written and illustrated by Billy Steers, which tell stories of teamwork, friendship, and kindness centered around the eponymous tractor and his farm friends (think Thomas the Tank Engine, but with a folksier, more communal vibe). For kids curious about the birds on your land, Lisa Steele’s “Let’s Hatch Chicks!” shows how an egg becomes a chick with beautiful and informative illustrations by Perry Taylor. “Plant, Cook, Eat! : A Children’s Cookbook” by Joe Archer (whose credentials include a job as the horticulturist at the British Royal Botanic Gardens) and Caroline Craig with charming illustrations by Sarah Mulvanny teaches kids about the process of growing and making food, including simple and tasty recipes that you can make together. For the kid that just can’t get enough of anything with wheels, there are a number of electric powered mini-tractors that usually sell for over $200. Well-known brands like John Deere have a kid-sized tractor includes a wagon if your child wants to help with small projects around your land or even just take their stuffed animals for a ride. You can also get John Deere power scooper with — you guessed it — a functional scooper for the helpful little homesteader. Barbie can be a controversial figure in the world of children’s toys, but over the past few years, Mattel has been making efforts to have Barbie more accurately represent our diverse and wonderful world. 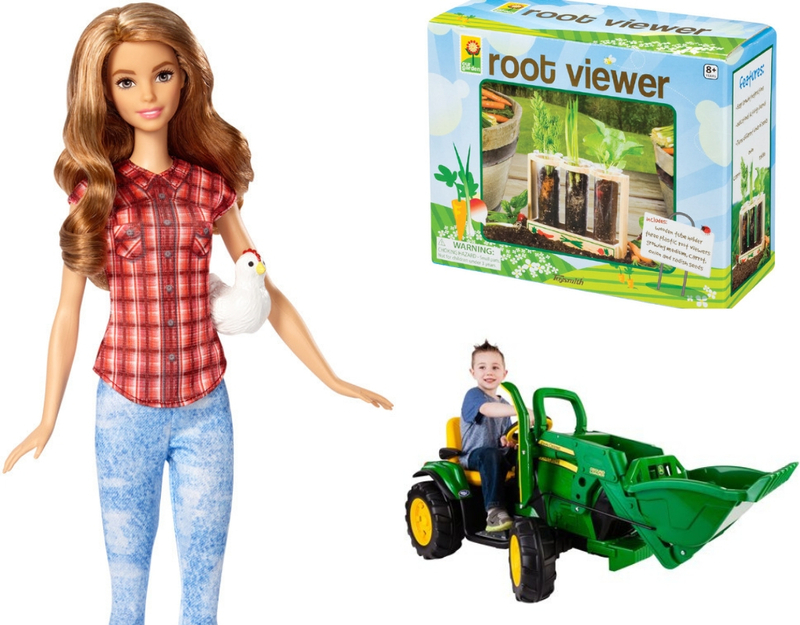 One of the ways the company has done this is by adding new professions to Barbie’s repertoire — namely, farming. The fashionable and functional Farmer Barbie, who retails for about $10, comes outfitted with a plaid shirt and work boots (which fit perfectly on her sensibly flat feet) as well as her own plastic chicken figurine. There is also a farmer Barbie doll set that comes with a tractor and a bevy of plastic livestock, including a chicken, sheep, cow and some ducks. Your little farmer might be too young to own their own animals, but you can always stoke that enthusiasm for the majestic creatures by gifting them a toy menagerie. For just a few dollars each, you can get all sorts of farm animal figures: cows, sheep, pigs, goats, chickens, and donkeys. Horse figurines come in a variety of breeds, and you can even get miniature wooden horse paddocks and barns for your little farmer to practice corralling and bringing the animals in at night. Barns for figurines are great, but you can also get playhouses that are big enough for your little homesteader to play in. There are a range of options for indoor and outdoor use. Small, pop-up tents, which are usually sold for under $100, are perfect for playing farm in your living room. Outdoor options can range from a couple hundred to over a thousand dollars, the latter of which often include jungle-gym add-ons like swings and slides.